Is Dairy Bad for Your Pet? 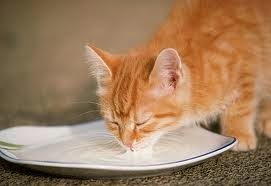 A cat lapping up a saucer of milk seems very natural and your cat may love it, but in reality it can be very problematic for your pet. What is dairy? Cheeses such as butter, cream cheese or hard cheese; milk, ice cream, cottage cheese and products containing dairy. Digestive Issues - Dairy foods containing milk can be hard to digest and can result in diarrhea. If your pet has loose stool, vomiting, diarrhea, your pet may have food allergies or acid stomach. Gastro ULC and Power Probiotic can relieve acid stomach and digestive enzymes such as the Soothing Digestive Relief will firm up the stool. Food Allergy- Dairy is a big allergen for people and pets. Many times veterinarians may even recommend dairy such as cottage cheese, when a pet has digestive problems. However, dairy products are one of the most highly allergic foods to people and pets and should be avoided. Symptoms of a dairy allergy are scratching, itching, ear infections, diarrhea, vomitting and gagging. Weight Gain- Cheese and butter are high in fat and can trigger a pancreatitis attack. They can also contribute to weight gain. Yeast Overgrowth-Cheese contains lactose (milk sugar) which feeds yeast overgrowth and bacterial infections. If your pet has an odor, is licking at the groin area or is getting yeast infections in the ears, sugar is the worst food you can give them. K9 Yeast Defense and Power Probiotic have been extremely helpful in controlling yeast overgrowth.